Have you seen photos imprinted on wood and wanted one? Well, stop wishing and make your own with this video! If you would like to know How To Transfer A Photo To Glass then see this article here. What Did the Video Say? The video informs you that although it is encouraged to use a photo taken by an SLR camera, you can still use other photography methods able to capture the photo you want to transfer to the wood, like your mobile phone. Good news is, the photo you want does not even have to have good quality; the photo transferring technique can still produce great work! 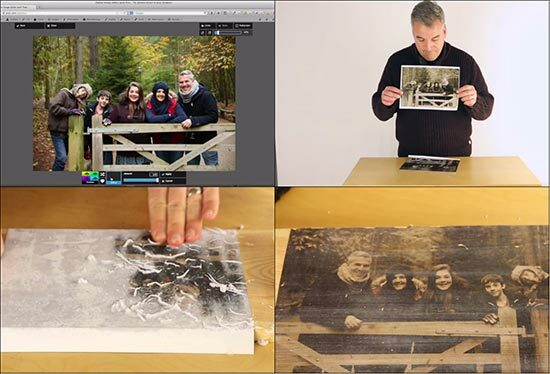 Next, the video discusses all of the processes required throughout the technique to successfully transfer the photo to wood, including using a computer for editing effects. Of course, you are going to need some materials. The video’s illustrator shares information on what materials are needed, where you can get them and the approximate cost of them. In conclusion, you learn how to settle the picture for long-lasting display. Should You Pay Any Attention to What the Video Had to Say? Good chances are you are watching this video because you either want to learn how to transfer a photo to wood or want to use a different technique. This video covers a great amount of detail to help walk you through the process! This is especially true if you are interested in using a computer to edit your photo if you want. Using a professional editor can be a little challenging if you are not used to working with filters, alterations, and adjustment icons. If you happen to fall into this category, the video will not only give a good editing service to you but will also show you how to use it.